Kent Locations Used: Euro Tunnel, Folkestone Harbour, Discovery Park, Folkestone, Deal and Deal Pier, Dover including the Port and Dover Castle, Westwood Industrial Estate Margate, Ramsgate, Botany Bay – Broadstairs, The Barn in Upstreet, St Martin’s Hospital, Knowlton Court and many more. The Tunnel: Sabotage is the second series of Sky Atlantic’s critically acclaimed show, re-uniting unlikely Anglo-French detective duo Karl Roebuck (Stephen Dillane) and Elise Wasserman (Clémence Poésy) on another intense investigation. 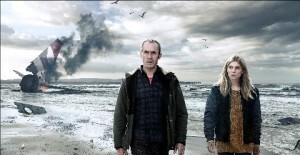 While series one was a re-imagining of Scandinavian drama “The Bridge”, the new series is an original story by Ben Richards (Outcasts, Spooks) and kicks off with two seemingly isolated events: a plane crashing into the Channel, killing everyone on board and a French couple abducted from the Eurotunnel. Elise Wasserman (Clémence Poésy), having been promoted to French Commander, is reunited with DCI Karl Roebuck (Dillane) to investigate the two cases. The cross border teams follow a shocking trail of devastation as the victims mount up and become embroiled in a terrifying, deadly game. The gripping eight part thriller is a Sky Atlantic and Canal+ co-production, made by Kudos and Shine Films France. 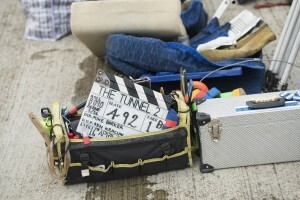 Joining The Tunnel’s acclaimed production team for the second series are director Mike Barker (Broadchurch, The Smoke) and producer Julian Stevens (Hustle, The Fall). 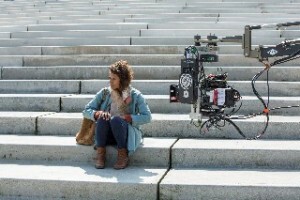 Stephen Dillane (King Arthur, Game of Thrones) and Clémence Poésy (127 Hours, In Bruges) return in the lead roles, supported by Angel Coulby (Merlin, The Jacket), and new to series two, Emilia Fox (Silent Witness, The Wrong Mans), Clarke Peters (Notting Hill, The Wire), Paul Schneider (Parks and Recreation, The Newsroom) and William Ash (Waterloo Road, Shameless). East Kent is ideally situated with great transport links both to London and Europe. The area boasts a wealth of locations including industrial as well as historic buildings and beautiful coastal landscapes. East Kent has previously featured on screen in many projects such as Avengers: Age of Ultron (2015), Edge of Heaven (2014), The Honourable Woman (2014), Sherlock Holmes – A Game of Shadows (2011), Great Expectations (2011/2012), On A Clear Day (2005) and Die Another Day (2002). Don’t miss the much anticipated return of The Tunnel: Sabotage which starts on Tuesday 12th April 2016 at 21:00 on Sky Atlantic. The whole series will also be available on Sky Box Sets from this date. This entry was posted in Filmed in Kent and tagged Botany Bay, Clémence Poésy, Deal, Discovery Park, Dover, Dover Castle, East Kent filming, Euro Tunnel, Folkestone, Folkestone Harbour, Knowlton Court, Ramsgate, St Martin’s Hospital, Stephen Dillane, The Barn in Upstreet, The Port of Dover, The Tunnel: Sabotage film locations, TV Drama, Westwood Industrial Estate Margate. Bookmark the permalink. 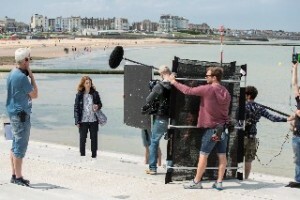 ← Channel 4 series Born On casting in the Whitstable area!